After a few days exploring the coffee scene in London, it is apparent that third wave coffee is influencing drinking habits, mainstream coffee offerings and where to hang. From the industrial design inspired coffee houses Ozone, Allpress and Shoreditch Grind, to the design cues of Workshop, Tonic and Rapha, it is apparent coffee takes centre stage. The minimal image references to the product and its source demonstrates a confidence in their coffee expertise. 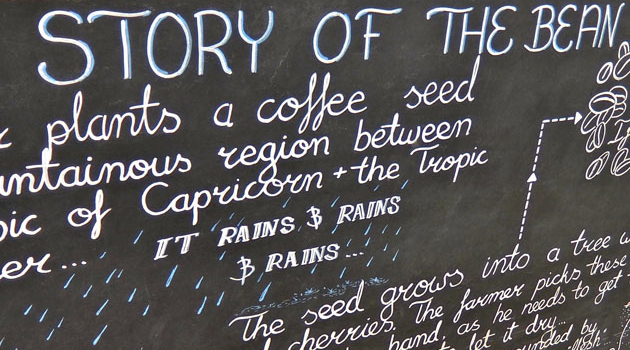 Where Starbucks and Costa saturate their environments with scene setting coffee graphics, trying to reassure customers that they know coffee, the third wave spaces let the baristas and product tools do the talking. A visit to chain Harris + Hoole in London Bridge demonstrates the influence of the variation of coffee making styles, with Aeropress’s , V60’s and information on the make up of their blend clearly on display. What Harris + Hoole offers is clearly mainstream, satisfying the office workers, but the merchandising and sharing of coffee information confirms that interest and a quality experience is high on the agenda. From Look Mum No Hands to Timber Yard, professionals looking for a third space or free wifi encourage spaces that have little buzz. The sound of keyboards or the hissing of headphones have made these spaces an extension of the office. Spaces that did have buzz included Workshop and Ozone and what set these apart was the hum, smell and theatre of the roasting machines confirming their passion for coffee. At Benugo Espresso Bar in Kings Cross it was a chance to taste a cold brew coffee, a passing fad or drink to catch on? The coffee was refreshing and sweeter, served in glasses. The bar had a continental style that would not look out of place in the grand arcades of Milan. An interesting design feature within the environment was the espresso machine on the customer side of the floor rather than on the counter. This gave a great sense of pride and sharing to the making of coffee, enabling all customers to get up close and personal with the barista. Kaffiene, Flat White, Speakeasy, The Borough Barista are refreshingly simple spaces. Where most food retailers look to the great markets of Europe for inspiration in design, these coffee shops have created spaces where the barista is king and the counter is center stage, no need for hessian sacks or crates here. Where a coffee shop roasts their own blends, these are sold in brown bags with applied labels or minimally styled pre packed bags elevating a sense of craft, freshness and passion for the product. A number of these coffee shops are boutique in their purpose but the ability to now get a good cappuccino without chocolate on top or to pop down to your local for a bag of beans will influence the big three, putting gentle pressure on them to enhance their product, environment and service.